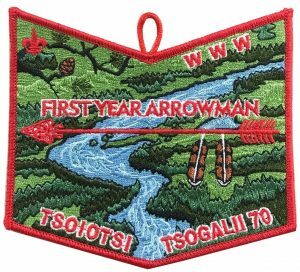 At the Tsoiotsi Tsogalii Lodge 70 Fall Fellowship this past weekend members received their First Year Arrowman patch. For this first year all members were eligible to earn the patch if they fulfilled the requirements of being active and attending several chapter meetings. In the future only new Brothers will have the opportunity to earn the patch. 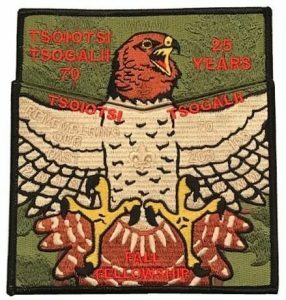 Tsoiotsi Tsogalii Lodge 70 issued a new flap this weekend to commemorate its 25th anniversary. Accompanying the flap was the 2018 Fall Fellowship patch. The plan is to only sell the flap paired with a similar bottom piece at upcoming 2019 lodge events. The QR code on the back reports there are 1,100 flaps and 300 Fall Fellowship patches.